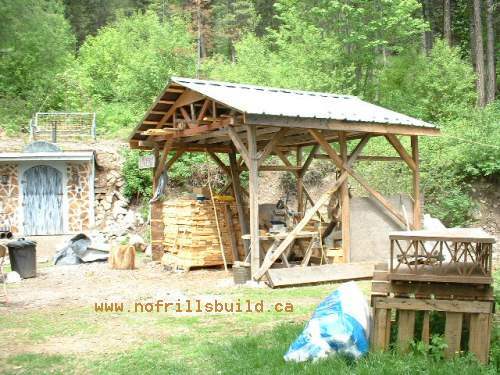 It took us a while to build a proper wood shed due to time constraints and all kinds of excuses. 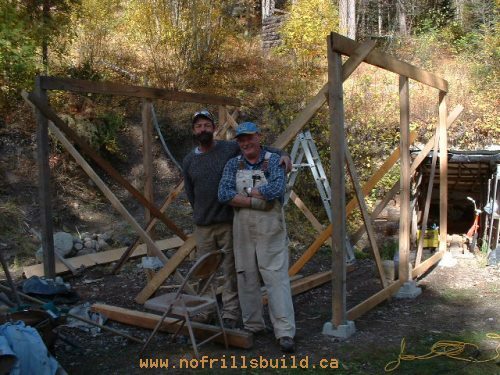 Finally, we set to and got it done, using some trusses that we had traded for, salvaged metal for the roof, and some 4x4 posts for the corners and braces. All told, this shed can hold up to eight cords of wood (a bush cord is 4' x 4' x 8') and with 20 acres of bush and woodland, we can easily use a shed that will hold that much. 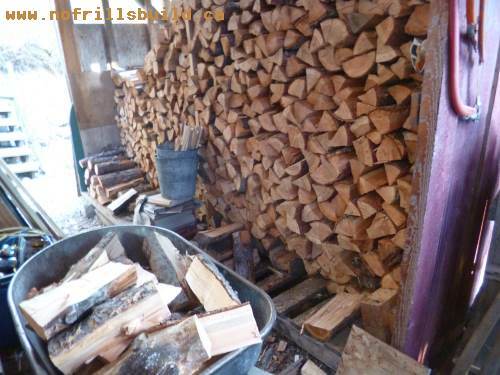 However, the most we have ever needed in our air tight wood heater is about 4-5 cords over the winter. Now that we have built out little cottage, Pearls Place, we anticipate using less than that. Actually, as it turns out, we burned about 2 and a half cords for the winter of 2013. With new double paned windows and the full amount of insulation in the roof, it will be less than that in an average winter. 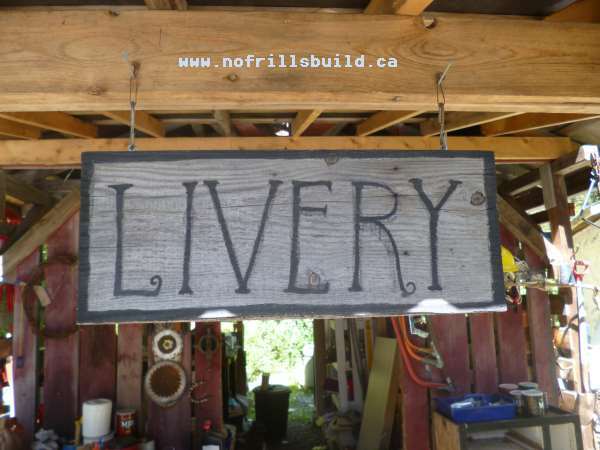 The Livery Wood Shed is built with no foundation, like many of our structures. We used concrete footings simply placed directly on the well drained soil, and built the timber framing on top of that. The crew of two, building the main structure. Once the roof was on, the rest of the bracing and enclosure was done later. The enclosing was simple salvaged boards nailed on, leaving a gap for air flow between. That's a good tactic for storing hay as well as firewood. 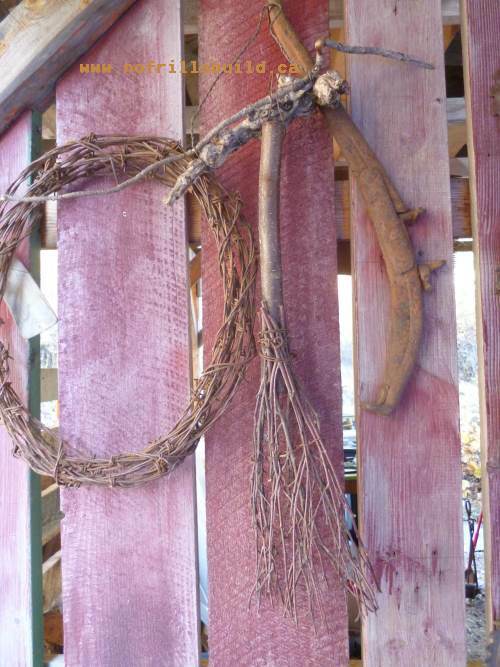 It's a really simple and basic structure; wood sheds don't need much more than a roof; it's crucial to have good air flow to season the firewood, and keep it dry after that. The gaps are deliberately built in, and the shed is built to take advantage of the prevailing wind from the southwest. The floor where the wood is stacked is just old pallets to hold the wood up off the ground, which has been known to flood in the spring. Most of the firewood we burn is either Douglas fir or pine from our property, or larch that has been dead and standing for a long time - otherwise known as 'grey backs' for the silver appearance.